"57 years ago this week, Fidel Castro traveled to New York City. The trip included a rally in @centralparknyc, where a bomb-carrying assassin was thwarted, as well as a visit to the @bronxzoo. 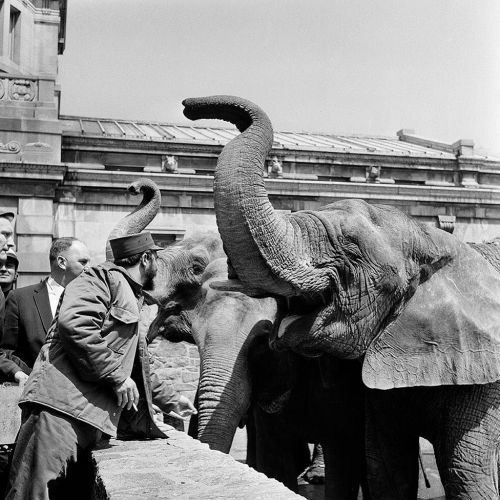 After he fed the #elephants pictured here in a photo by @nytimes photographer Meyer Liebowitz, the Cuban leader said that the zoo was "the best thing New York City has." Yesterday, #Castro bade farewell to Cuba's Communist Party, telling party members that he would soon die and urging them to fulfill his communist vision. "Soon, I will be 90," he said in a strong but rasping voice at the close of a 4-day party congress in Havana." By nytimes on Instagram.